Modern digital cameras have advanced metering systems that can deal with most lighting conditions automatically but there may be times when a camera can’t correctly expose the image or when you may want to add your own artistic twist to the photo. 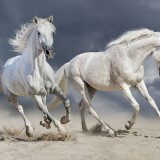 In the photography world, “exposure” is a term used to assess the lighting of the image. A properly exposed image will have the right amount of light and thus be pleasing for the eye. 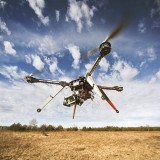 Underexposed image will be too dark; overexposed – too bright. Even the best camera may misjudge the correct exposure when on automatic setting, that’s why most professional cameras have exposure override function called Exposure Compensation (EV comp). 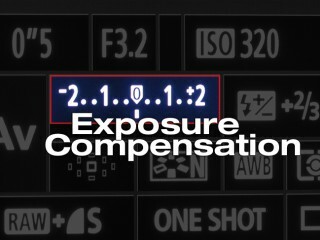 Exposure Compensation allows the photographer to adjust automatically calculated exposure. The “automatic” part comes in because the exposure compensation function simply resets the brightness setting – every other value is adjusted automatically (i.e. lens f-number, ISO or a combination of these). Exposure compensation feature on most digital cameras is usually a “sliding scale” with the range of adjustment going from -2 to +2 EV in 1/5 or 1/3 stops, though some cameras have wider scale ranging from -5 EV to + 5 EV. 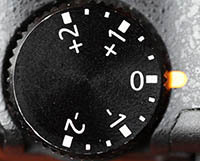 Exposure compensation button is usually indicated with a “+/-“sign. Go positive and you will let in more light into the image; go negative and less light will be applied. Exposure compensation is a useful trick to have up your sleeve. Let’s take a landscape snow shot during a bright winter day as an example. Camera’s automatic metering setting might over-compensate for too much brightness and make the image quite dark. To correct this, just slide the EV scale several positive stops and you’ll end up with a well-exposed image. Another example – a portrait shot of a subject on a dark background. In this case, the camera’s automatic setting might factor in the darkness of the overall shot and over-expose the subject. Go negative on the EV scale to correct the under-exposure. It is important to remember that with exposure compensation you are still relying on camera’s built-in sensor, you are just telling the camera to add or subtract some light from the composition. It is still a useful feature to use if you don’t want to manually change shutter speed or lens f-number but just want to make the image darker or brighter. Most cameras will not let you use exposure compensation if you shoot in fully automated mode, though if shooting in RAW format, you’ll be able to adjust exposure in post processing. Exposure bracketing is a technique of taking several (usually three) shots of the same subject (preferably with a tripod) while using different exposure settings. For example, you can take three images: one slightly under-exposed (by dialing in negative exposure compensation to -1/3EV), second image with exposure compensation set to 0, and the third one slightly over-exposed (by dialing in positive exposure compensation to +1/3EV). Bracketing is useful in situations that make it difficult to obtain a pleasing image with a single shot. For example, if shooting a restaurant entrance on a sunny day with the interior dark and exterior bright, it’s best to take three shots and then combine them in post processing by using HDR or manually. 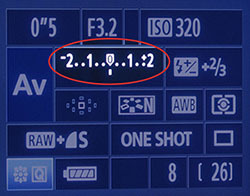 Most digital cameras have auto exposure bracketing (AEB). If you select this option before taking your shot, the camera will automatically take three shots for you. Delve into your cameras settings if you’d like to change the range of exposure stops for each of the three shots.